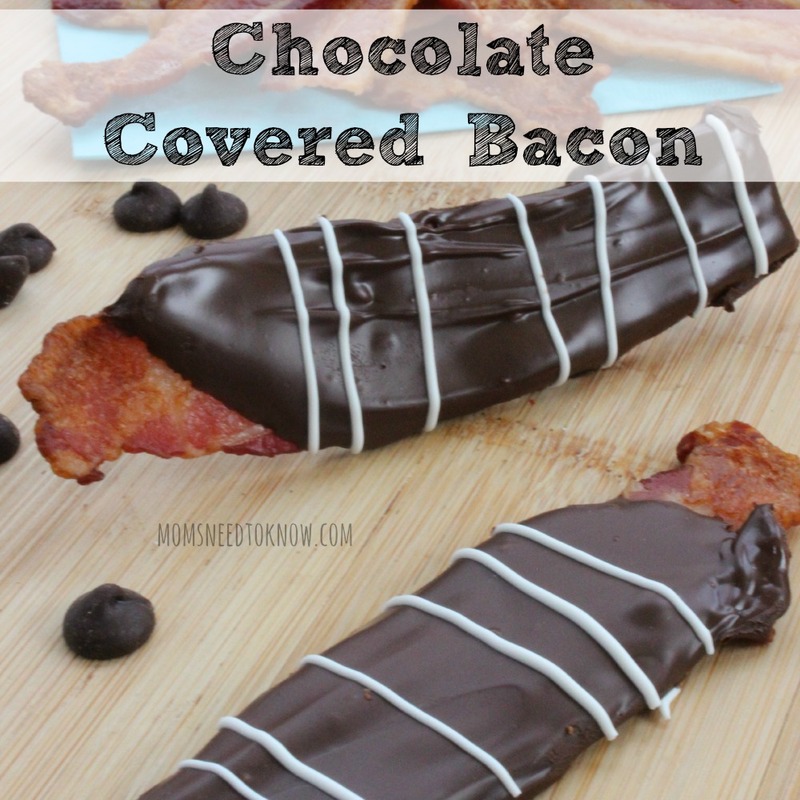 Of all the things that I never thought I would like, this chocolate covered bacon recipe is the one that surprised me the most. I love chocolate and I like bacon, but I never thought that they went together that well. The secret to making chocolate covered bacon come out right is getting the bacon exactly crisp but not in any way burnt. The best way to ensure that this happens is to cook your bacon in the oven (it also creates WAY less mess). You are also going to want to make sure that the bacon is completely cooled (actually – you are going to freeze it) before you start to coat the bacon with chocolate. So when should you serve it? That's the beauty of chocolate covered bacon. The saltiness makes it a perfect appetizer (this would be great to eat with a glass of Chardonnay, but the sweetness makes it a great dessert as well. Put this on your Easter menu and your guests will be happy campers! To get started, you are going to want to cook up your bacon in the oven, making sure that it is nice and crispy! Let it drain and completely cool…then you are going to want to cut the bacon strips in half and freeze it! 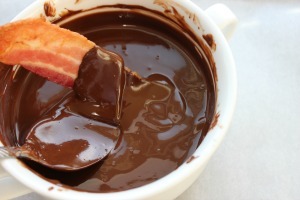 Once the bacon is frozen, you are going to want to melt your chocolate and get to dipping! Since the bacon is frozen, this should be a relatively easy process. Just make sure to let the chocolate completely cool between dipping it in the semisweet chocolate and adding the white chocolate drizzle! 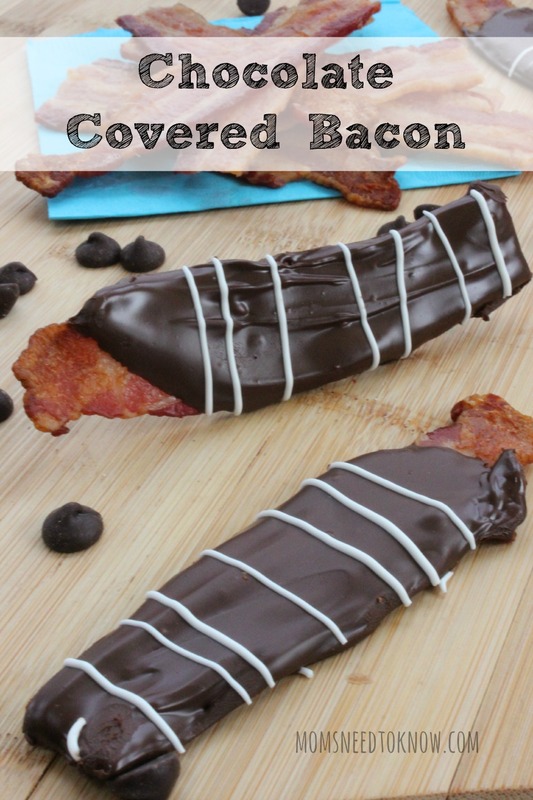 The best part is that this chocolate covered bacon recipe can be made in advance (although I would do it no earlier than the night before you plan on serving it). Just store it in the refrigerator until you are ready to serve! This chocolate covered bacon recipe works both as an appetizer or a dessert (or even just a fun snack). So easy to make, as long as you make sure to follow a few important steps! Line baking sheet with foil and place bacon on foil. 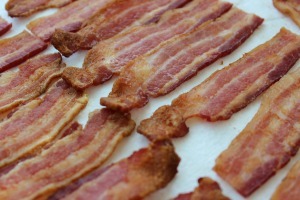 For crispy bacon, place on a cooling rack on top of the foil and place the bacon on top of the cooling rack. Bake 16-20 minutes or until desired crispness. Cut bacon slices in half and place in freezer for 30 minutes. 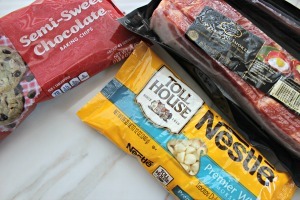 Dip bacon in chocolate, shake off excess and place on wax paper. Pipe drizzles of white across bacon pieces. Mmmm, this looks so amazing. I can just see my boys faces if I made these for them. I had this at a baseball game one time and it was THE BEST! Yum! I love chocolate covered bacon and yours look wonderful!! !